The Monday night NFL game on November 8, 1976 featured two contenders, the Cincinnati Bengals and Los Angeles Rams, both of which were battling for control in their respective divisions. The Bengals were 6-2 under first-year Head Coach Bill Johnson, successor to Paul Brown (the founding coach and still owner and GM), and seeking to remain ahead of the Pittsburgh Steelers in the AFC Central. The offense featured the efficient passing of QB Ken Anderson while the defense, which already had an outstanding backfield that included CB Ken Riley and SS Tommy Casanova, was benefiting from the pass-rushing prowess of DE Coy Bacon. The Rams, coached by Chuck Knox, had a 6-1-1 record and were looking to pick up ground on the 49ers in the NFC West, which they had topped in each of the previous three seasons. While there was instability at quarterback, with James Harris the current starter, the running game, featuring HB Lawrence McCutcheon, was sound and the tough defense was effective against both the run and the pass. It was a cold 27-degree night at Riverfront Stadium with 52,480 fans in attendance. 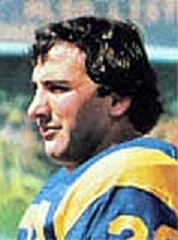 On the first play from scrimmage, Coy Bacon clotheslined FB John Cappelletti of the Rams behind the line of scrimmage, causing a fumble that DT Bob Brown recovered for the Bengals. They were unable to cash in a few plays later, however, when Chris Bahr’s 44-yard field goal was nullified by a penalty and his second try from 50 yards missed the mark. Cincinnati’s next possession ended with a punt and Pat McInally’s shanked kick traveled only 24 yards. That set up a 50-yard drive in seven plays by the Rams in which Cappelletti had runs of 9 and 17 yards and a pass interference penalty gave Los Angeles a first down at the Cincinnati 24. But after advancing to the two, the visitors couldn’t reach the end zone and settled for Tom Dempsey’s 19-yard field goal that nevertheless put them ahead by 3-0. The Bengals had a breakaway run by rookie HB Archie Griffin canceled by a penalty and remained stymied on offense for the remainder of the half. Meanwhile, the Rams had another shot when they gained possession at midfield, but penalties kept them out of scoring range. In the second quarter, the Rams put together a 13-play, 80-yard possession but, after reaching the Cincinnati 15, Lawrence McCutcheon was stopped for a three-yard loss on first down and the drive stalled. Dempsey booted a 23-yard field goal that extended the lead to 6-0. In their last series of the first half, LA reached the Cincinnati 28 but QB James Harris fumbled when sacked by Bacon, and while the Rams recovered, they lost 14 yards and were taken out of field goal range. The score remained unchanged at halftime. The Rams outgained Cincinnati 173 yards to 57 in the first half, but had only two field goals to show for it. Ken Anderson was ineffective in the first 30 minutes, completing just two of 12 passes for five yards as the Los Angeles defense kept the receivers in check. The tables began to turn early in the third quarter. 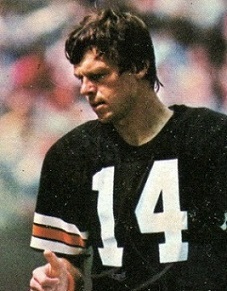 Harris fumbled while being sacked by DE Gary Burley and Ken Riley’s recovery gave the Bengals possession at the LA nine. Cincinnati quickly cashed in as FB Boobie Clark (pictured below) ran for a touchdown on the next play and Chris Bahr kicked the extra point to put the home team in the lead by 7-6. The score off of the turnover ignited the Cincinnati offense. On their next series, the Bengals advanced 80 yards in six plays as Ken Anderson threw to Clark for 19 yards, had a 25-yard run, and followed up by firing a pass to TE Bob Trumpy, who split the safeties for a 30-yard TD. The extra point try failed, but Cincinnati’s lead was now 13-6. The Rams were forced to punt from deep in their own territory and Cincinnati went 53 yards in seven plays on the next possession. Anderson completed passes to WR Billy Brooks for 14 yards and TE Bruce Coslet for 17 before a toss to Clark coming out of the backfield went the distance for a 17-yard touchdown. Bahr successfully converted this time and the Bengals were up by 20-6. There was still plenty of time and the Rams had scoring opportunities in the fourth quarter. First, they reached the Cincinnati 14, but a second down pass by Harris intended for WR Ron Jessie bounced off the receiver’s hands and was intercepted by Tommy Casanova. On their next possession, the Rams advanced to the Cincinnati five, but again turned the ball over when McCutcheon fumbled and FS Bernard Jackson recovered. 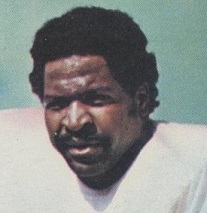 Late in the game, and following a fumble by HB Tony Davis that LB Isiah Robertson recovered at the Cincinnati 38, LA finally reached the end zone three plays later. Harris completed passes to McCutcheon for 21 yards and to Jessie for a 17-yard TD. But Dempsey missed the point after, maintaining an eight-point spread, and the Bengals held on to win by a final score of 20-12. The Rams led in total yards (342 to 299) and first downs (21 to 15). However, they also turned the ball over four times, to two by Cincinnati, and squandered too many scoring opportunities. Ken Anderson overcame his slow start to complete 11 of 26 passes for 132 yards and two touchdowns while giving up one interception, and was particularly sharp during Cincinnati’s scoring drives in the third quarter. Boobie Clark rushed for 70 yards on 16 carries that included a TD and added another score among his three catches for 30 yards. Billy Brooks also contributed three pass receptions for 44 yards. For the Rams, James Harris was successful on 16 of 28 throws for 193 yards and a TD as well as an interception. John Cappelletti (pictured at right) topped the runners with 86 yards on 20 carries and Lawrence McCutcheon added 76 yards on his 20 attempts. WR Harold Jackson and Ron Jessie caught 5 passes apiece, for 75 and 59 yards, respectively, and Jessie scored LA’s only touchdown. Cincinnati kept on winning and was at 9-2 before losing two straight contests, including the rematch with the Steelers. Both ended up at 10-4 and the Bengals, having been swept by Pittsburgh in the season series, found themselves in second place and out of the playoffs. As for the Rams, Coach Knox made a change at quarterback following the loss to the Bengals, replacing James Harris with Pat Haden. They went 4-1 the rest of the way to once again top the NFC West with a 10-3-1 record but, after edging the Cowboys in the Divisional playoff round, lost the NFC Championship game to Minnesota. Ken Anderson didn’t lead the NFL in passing, as he had in 1974 and ’75, but he still had a respectable year as he threw for 2367 yards and 19 touchdowns, while giving up 14 interceptions, and had a passer rating of 76.9. He was selected to the Pro Bowl.